A nice summer harvest from GrowJourney’s cofounders’ no-till organic/permaculture garden. 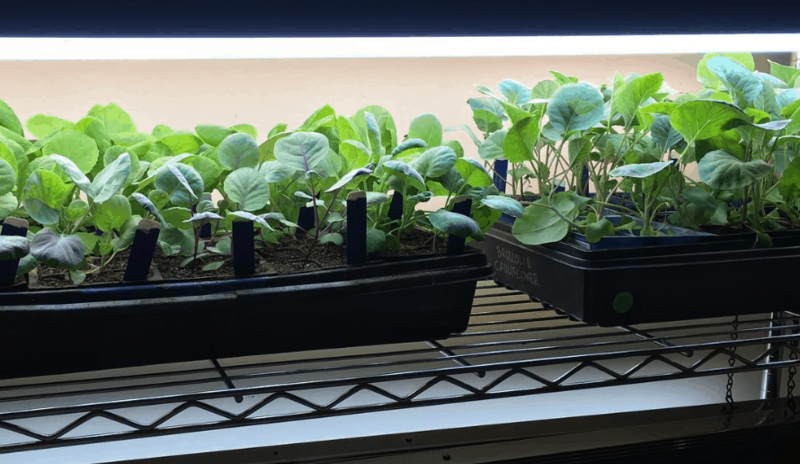 What if I told you that you could grow baskets full of organic produce without having to till your soil? Or fertilize? Or pick weeds? 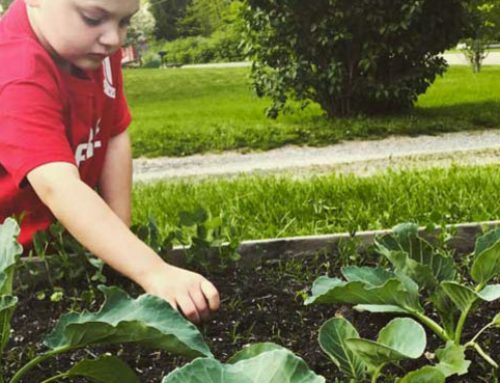 At GrowJourney, we’re outspoken proponents of no-till organic gardening and farming practices. Researchers at Rodale Institute have shown the innumerable benefits of no till organic farming in their 30 year trials. And piles of research have also proven the benefits of using similar no-till methods in your garden, as we’ve written about here. 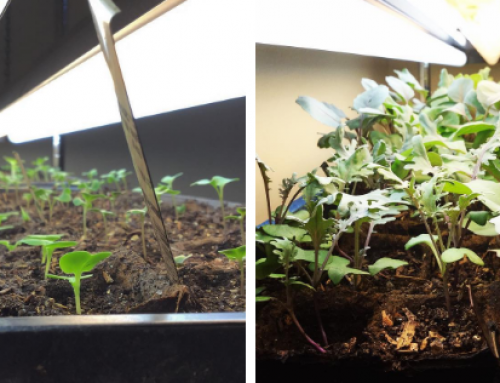 We’ve put these methods to use in our own gardens, and have personally experienced the many benefits of no-till organic gardening. A soybean crop growing through roller-crimped cover crops at Rodale Institute. The cover crops feed and protect the soil while blocking out weeds. No fertilizers, pesticides, or herbicides are required. Yields match or exceed conventional input-intensive farming practices while providing additional social and environmental benefits as well. If you’re using no-till organic methods on a large scale—such as on a farm—that requires you to use “green mulches,” aka cover crops (unless you have a forest farm/food forest). Cover crops also work on a small-scale, such as in your garden, but you can opt to use “brown mulches” such as leaf and wood chip mulch. Both brown and green mulches feed the soil microorganisms that make soil a living, functioning system (aka “the soil food web”) which then feeds and protects your plants. 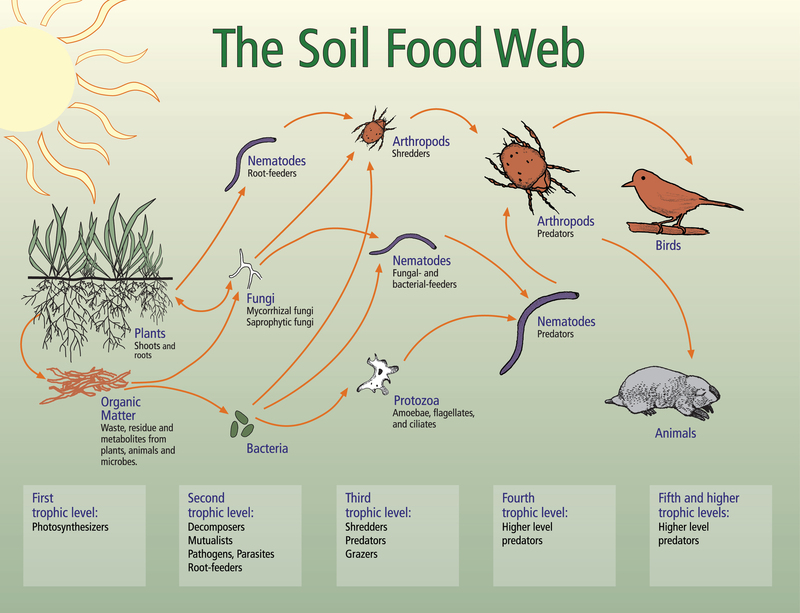 A few of the critters that comprise the soil food web. In our area of the country, trees are abundant, and provide a range of beneficial “waste” products for gardeners. We like to use chopped fall leaves as a mulch and as browns in our compost. But our favorite garden mulch is wood chips (*untreated and preferably hardwood mulch). Wood chips offer the added benefit of making a visually attractive edible landscape, unlike bare exposed dirt which doesn’t tend to be very attractive. 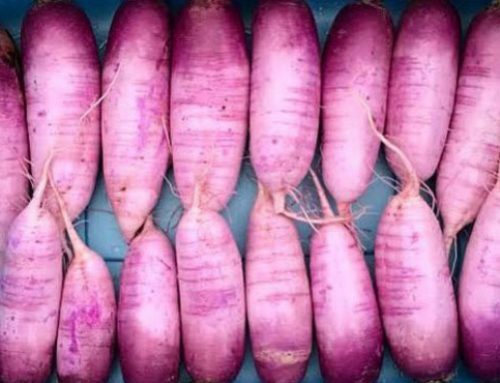 Can an edible, organic no-till landscape also be beautiful? We think so. This is a photo of one of the front yard garden beds of GrowJourney’s cofounders. 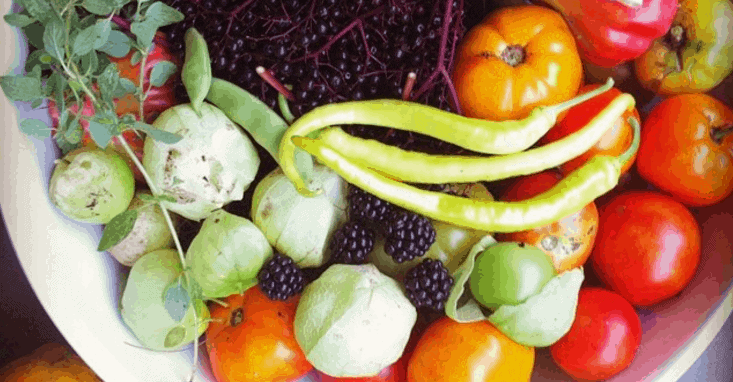 Squash, strawberries, nasturtiums, alliums, Camellia sinensis, grapes, beans, elderberries, tomatoes, and other edible plants can be seen where grass used to grow. How many more species can this multifunctional landscape support relative to a monoculture grass lawn? How much more carbon can be sequestered? How much more human food can be produced? Beauty is an important function in a garden, but beauty isn’t very important on a large farm that doesn’t have to worry about what the Joneses or the HOA think. Also, in our area, local tree service companies will often even drop wood chips off at our house for free, since it saves them the municipal disposal costs. How Much Wood Could a Woodchuck Chip In a No-Till Organic Garden? Heirloom squash growing in a heavily mulched, no-till organic garden bed. Ok, all that sounds great… But what does this have to do with preparing your garden beds for spring? A tomato seedling transplanted into a bed with wood chip mulch. Notice that the wood chips are pulled away from the stem of the plant so as not to cause stem rot. A small stick is inserted next to the stem of the plant in order to deter cutworms. Pick the option below that sounds most like you, then get growing, er going! I already have garden beds with healthy soil – If you already have established garden beds with good soil biology (e.g. your plants have grown well without any fertilizer), then your job is simple. Just top-dress your beds with 6″ of wood chip mulch in the spring, and plan to do the same thing again in the fall. When transplanting your seedlings into the bed, simply pull back the mulch, make a small hole in the soil, plop in your seedling, and be sure not to pile the mulch back around the stem of the seedling since this could cause the stem to rot, thereby killing the plant. So, keep the mulch very shallow right around the immediate vicinity of your plants’ stems and deeper further away from your plants. I already have garden beds, but my soil isn’t very healthy – If you’ve struggled to grow healthy disease-free plants or have had to use fertilizer to get your plants to grow, #2 describes you. Before putting on your wood chip mulch, you’re going to want to give your soil a microbiological boost by putting 2″ of pleasant smelling compost (you can also substitute worm castings which you can buy here) on the soil surface or by applying a deep drench of actively aerated compost tea (AACT). As soon as that’s done, top-dress the bed with 6″ of wood chip mulch and you’re ready to start planting. Add another 6″ of wood chips every fall and spring, and use compost, worm castings, and/or compost tea every 1-2 years as needed. I don’t have garden beds, but I want to make them in time to plant this season – We could write an entire article about how to start a new garden bed. There are multiple methods you can use that will work great: raised beds, in-ground beds, sunken beds (if you live in a really hot dry area), lasagna beds, hugelkultur beds, etc. Regardless of the type of garden beds you make, top it off with 6-8″ of wood chip mulch when you’re done. *Definition – “Top-dressing” means what it sounds like. Place the wood chips on the surface of your soil. Do NOT till the wood chips into the soil as this will temporarily rob your soil of plant-available nitrogen. 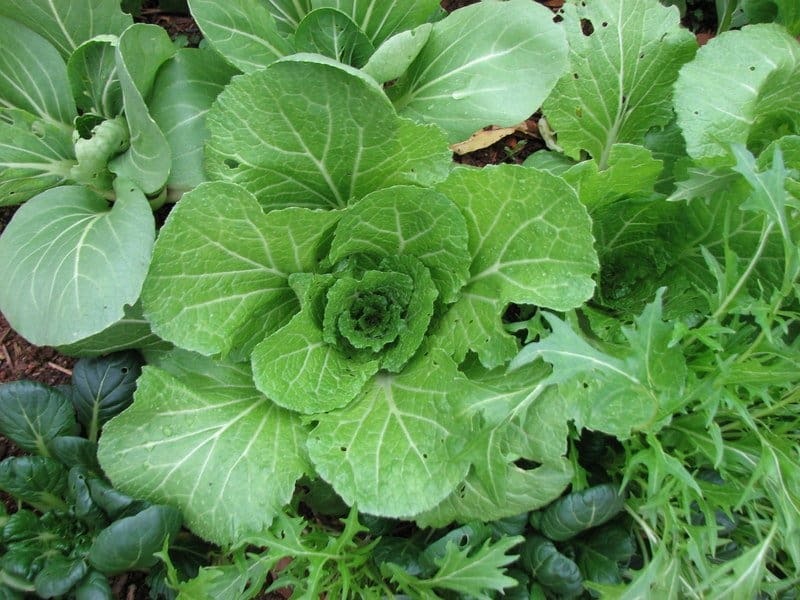 When you top-dress your mulch on to the surface of your garden beds, worms, fungi, arthropods, etc will slowly break down the mulch for you, aerating the soil and bringing bioavailable nutrients to the rhizosphere of your plants as they work. And they work 24-7 for free! We hope this gardening tip was helpful! If you have any questions, please ask it in the comments section below. Born in the foothills of the Appalachian Mountains, Eliza A. H. Lord’s roots in this area go back for generations. She’s a SC Master Gardener (2001) and Upstate SC Master Naturalist (2007). She founded Green Drinks Greenville and the SC Upstate Permaculture Society. For years her downtown Greenville urban farm has been a highlight of the Greenville Urban Farm Tour with its lawn-free edible landscaping, chickens, mushrooms, and bees. In addition to consulting, teaching classes, and writing for various publications, Eliza also maintains a permaculture “how-to” blog called Appalachian Feet. 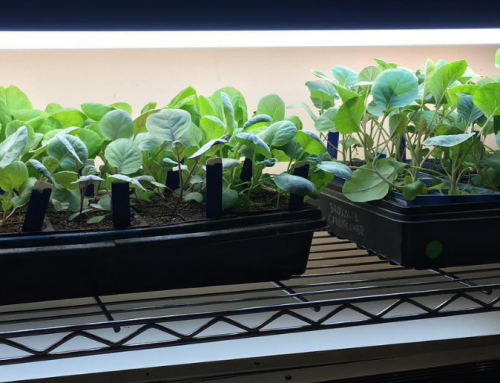 At GrowJourney, Eliza helps with everything from seed selection to ensuring that the online educational resources are fine-tuned to the needs of both beginner and expert gardeners. So I assume something like the below toxin-free wood shavings isn’t safe to use? A lot of people and pets can have allergic reactions (sometimes quite severe) to the plicatic acid in cedar, especially western red cedar. Plicatic acid is the compound that also makes cedar bedding insecticidal. If the shavings are outdoors in an open-air environment, that’s probably less of a concern, but I actually had a bad reaction to western red cedar shavings once when using it outdoors for our duck house bedding—and I’m typically not allergic to anything. If you’re using cedar shavings as animal bedding, then disposing of it as a mulch on your garden beds, that seems like a good final use vs putting it in a landfill (plus your animals have already added some nitrogen and other goodies in the process). We’ve found that it’s antimicrobial properties make cedar relatively slow to break down in compost, even using the Berkley hot composting method. We prefer to go for wood chips from tree service companies in our area. We tell our local tree service companies what we’re looking for (hardwoods such as maple and oak) and they drop loads off for free when they have them. It would be cost-prohibitive for us to use bagged wood shavings/chips, given the size of our garden. We do pay for triple ground mulch in our front yard gardens, because it looks nicer due to its consistent size, shape, and color. The more coarsely ground (and free) wood chips are fine for the side and back garden beds though. How do you grow plants in the garden directly from seeds with all the mulch? April: Great question! When direct-sowing, you simply pull the mulch back away from the spot where you’re starting your seeds. You don’t want a wall of mulch that could potentially collapse on top of the seeds, so tier it back, making it deeper as you go. For instance, there won’t be any mulch directly on the spot where you sowed your seed(s), but 6″ away from the spot there might be 2″ of mulch and 1 ft away, there might be 6″ of mulch, etc. Thank you April, I was wondering the same thing. Great information an some very good reminders here! My husband just finished with the preparation of the garden beds and adding mulch. I’m also done with all seed starters and and I’m now planning which vegetables where to plant. Found some good ideas in your post and definitely recommending it to my friends. Thanks for sharing! Thanks Lenore! Glad you found the article helpful, and even more glad that you’re mulching your garden beds. It’s so much better for your soil than tilling. Keep up the good work! Is this correct: 6-8″ of wood chip mulch and then do it again in the fall? That would be over a foot of wood chips by late season. Also, is that repeated every year or only done on the first year? Jason: We recommend top-dressing with wood chip mulch in the late winter/early spring and again in the late summer/early fall. What you’ll notice is that the chips will be consumed by your soil organisms rather quickly, especially when those microorganisms are very active during the warmer seasons. In our garden, we typically do 4-6″ of mulch twice per year, but Eliza and other organic gardening experts will go up to 8″. By the time you put on another layer of mulch in 6 months, there will only be about an inch or so left on your soil surface – the rest has been broken down and incorporated into your soil.